The world-weary warrior Aragorn took his rightful place as king. The actor who played him for three years has taken his rightful place as an in-demand leading man. 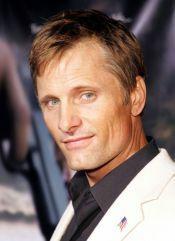 After years of serving films big (Crimson Tide) and small (A Walk on the Moon) with his brooding presence and unassuming manliness, Viggo Mortensen, 46, has earned the happy ending that the globe-spanning success of The Lord of the Rings trilogy has afforded him. Asked if he has suffered any Rings withdrawal since the final chapter, 2003's Return of the King, claimed the best-picture Oscar, he says, "I was ready to call it a day as far as the process of working on that character and that story. But the friendships endure." Indeed, he found time to reunite with fellow Rings alumni Sean Bean and Hugo Weaving at the recent Toronto International Film Festival. Most happily, Mortensen hasn't been forced to compromise his standards while capitalizing on his hard-won recognition. True, last year's dune-strewn horse opera Hidalgo was mostly a Disney diversion. But in his current A History of Violence, Mortensen gets the role of a lifetime, courtesy of director David Cronenberg (The Fly). The Canadian master of creep-out cinema is at his most deceptively mainstream as he examines the evil that even good men can do. And, with Mortensen, Cronenberg says, he found the perfect vessel to deliver his disturbing themes. "I put Viggo up with the top actors in the business," Cronenberg says. "I was startled by his subtlety. He's not focused on money or career at all, but fame and money could not happen to a nicer guy." Critics, even those who were unimpressed by Mortensen's noble grimacing in Rings, are taking notice. "The performance of his career so far," raved Rolling Stone's Peter Travers. In the provocatively pulpy Western-inspired yarn, Mortensen is a community leader in a small burg with a loving wife, a pair of kids and a homey diner to run. When two thugs try to rob his eatery and threaten his staff, he dispatches them with shockingly lethal ease and is declared a local hero. Then a squinty-eyed gangster (Ed Harris) from Philadelphia pays a visit and claims that Mortensen is actually a former Mob killer. And, suddenly, all is not what it appears. Ask the actor whether a predisposition toward rage lurks inside even a neo-hippie like himself, who protested the Iraq war and reaped conservative scorn because of it, and he says, "We all have that thing in us. We're animals, and life is violent. I see that side of myself. Sure, everyone has that." For the most part, Mortensen is a gentle, thoughtful soul whose artistic pursuits beyond acting include photography, painting and poetry. But when the subject is hockey, his devious side takes over. The die-hard Montreal Canadiens supporter took pleasure in taunting fans of the rival Maple Leafs while in town, sporting a team T-shirt during interviews. "They hate that," he says with an unsavory grin. Mortensen doesn't fool himself about why such a meaty part in a film with a $32 million budget, huge by Cronenberg standards, came his way. Before his Rings exposure, "I don't think a studio would have let me play the main part. I know I wouldn't have gotten the Spanish movie that I just did." The Spanish movie is Alatriste, based on another popular series of books. The New York-born Mortensen, who speaks the language after time spent in South America as a child, stars as the title 17th-century swashbuckler. "He is a career soldier and, through his eyes, you see society high and low, from the king on down to the poorest people." Mortensen turned down another Spanish film, preferring to spend more time in Los Angeles with Henry, his 17-year-old son with ex-wife Exene Cervenka of the band X, who is entering his senior year in high school. After the international acclaim for The Lord of the Rings, he realizes that life off-screen will never be the same. He can't even hang out in Iceland incognito. "I was there with my son, and we visited this hot springs in a remote place. It's all misty because of the air and water temperature difference. It was the middle of a weekday, so it wasn't full. I'm sitting there, drowsing and leaning against a rock. All of a sudden somebody taps me on the shoulder. This person had come out of the mist with a damp piece of paper and a pen, wanting an autograph. I was like, isn't this weird?"